When talking about Ai (artificial intelligence), we can’t deny the fact that it is the future. It is now being used in almost every other smartphone and companies are ready to pay tens of thousands of dollars to (AI) artificial intelligence engineers. They are always in a hunt for those people who can work for them and make their products future proof. 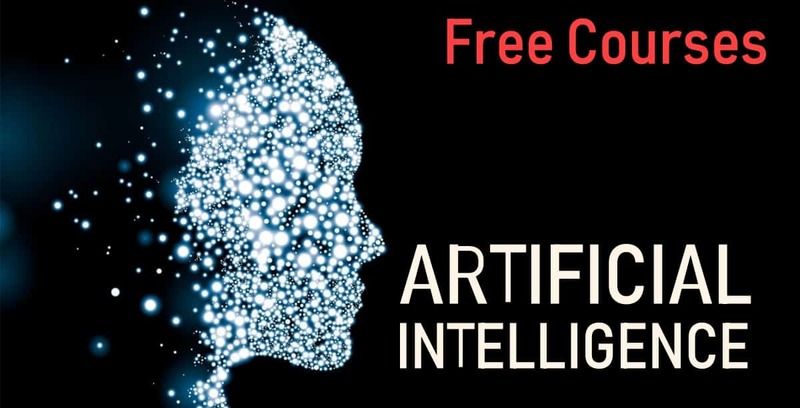 So in this article, we are providing you with the list of 6 Best free online Artificial Intelligence courses in 2018 which you can learn right away without any delay. But first, we all should be familiar with the term “What is AI (artificial intelligence)?”. For that, you need to follow the link below. Read – Difference between AI, Machine Learning and Deep Learning? Now, we all are living in a digital era. Hereby the word digital, we mean that everything is now easily available on the internet. It simply means you need not to go out in search of any kind of some information or pay any single penny to anyone for that. Just turn on the internet and google it. It’s, as simple as that. Which takes us back to the list of 6 absolutely free online artificial intelligence courses in 2018. Learn from Google AI – This is the newly launched resource from Google to make programmers more aware about the understanding of What is Ai? How it works and all. In short, they try to broaden the understanding of AI with the general public. This course contains the basic introduction of machine learning to getting started with TensorFlow. Not only that it also has designing and training of neural networks. The basic idea behind the creation of this resource is to provide an extensive set of knowledge to those people who have no idea about Artificial Intelligence (beginners). Also to those with some experience can pick or choose modules which interests them. Meanwhile, machine learning experts can use it as an introduction to TensorFlow. Google Machine learning – This course is slightly more in-depth offered from udacity. It wasn’t created to aim beginners, as it expects some experience in machine learning understanding from users. Stanford University/Machine Learning – As the name says it all. Stanford University is one of the best universities in the world. And of course, the reason why they are best is because they offer some great courses. Talking about this course, it is offered by Coursera and is well taught by Andrew Ng (Founder of Google’s deep learning research Unit). The best part of the entire course is that it’s absolutely free. But it also has an option of paying for certification. The course covers real-world implementations from speech recognition technique by enhancing web search. The course also offers topics related to statistics such as linear regression, the backpropagation methods through which neural networks learn, and Matlab tutorials as well. Columbia University/Machine Learning – Again this course it’s entirely free. But if you want to give boost to your career then, of course, there is an option to pay for its certification. In order to get most out if it. We advise you to spend more than 8 to 10 hours a week. Try almost every exercise and surely you will go through it like a pro. The course is offered through the non-profit organization edX, where it forms part of the Artificial Intelligence nanodegree. Nvidia/Fundamentals of deep learning for computer vision – Talking about computer vision. As you can judge by the name it’s an Ai for building computers which can “see” by processing visual information. In simple words in the same way, as our brains do. This course also covers technical fundamentals such as identifying situations and problems which can benefit with the help of machines. MIT/ Deep Learning for Self Driving cars – MIT took the approach of taking real-world scenario very seriously. The self-driving cars are expected to take over manually driving cars in the future. The reason is quite simple actually. Self-driving cars can drive better and there will be very fewer chances of accidents as well. The course offers teaching machines to interpret data from those sensors just as our own brains interpret signals from our eyes, ears, and touch, basically all sensory organs. It also offers MIT’s Deep traffic simulator, which challenges students to basically teach an automated car to drive as much fast as possible without colliding with another car to avoid a crash. This course was first taught at the bricks ‘n’ mortar university last year. And luckily all the videos and tutorials are available online. But the sad part is you can’t get the certification. So this was all regarding 6 Best free online Artificial Intelligence courses in 2018. If you have any suggestions then let us know in the comment section below.